There has been news for years now about how someday soon robots will begin taking over everyday occupations, destroying our economy and leaving humans without a sense of purpose. Well, I’m here to ease your worries by introducing you to the many robots that will soon be taking over everyday occupations, destroying our economy and leaving humans without a sense of purpose. So come join me in welcoming our robot overlords as we go through the “who’s who” of mechanical job-stealers. The most bluntly named of the robots on this list, Flippy has no issue with flipping burgers the rest of its life. The robot, which is currently being integrated by the California burger chain Caliburger, is built to perfectly cook and flip hamburgers, even putting them in a bun afterwards. But, as is the great limitation with our robotic counterparts, it still can’t put condiments on said burgers. Take that, robot empire! Are you tired of the 30 seconds of human interaction it takes to order a cup of coffee? Then look no further than Cafe X. The “robotic cafe” kiosk, which can currently only be found in San Francisco, makes a variety of latte drinks without being as mistake-prone as the species that created it. At least it won’t spell your name wrong on the cup every time. Why spend 20 dollars on a babysitter for your night out when you can leave your child with a cold, heartless robot? The iPal, created by AvatarMind Robotics, acts as both a companion for children and a way to monitor them while parents aren’t present. Coming in at 3 feet tall, the iPal can do everything from singing and dancing to teaching scientific facts. So it’s basically like Mary Poppins, just with less whimsy and wonder and more uncanny development of feelings of detachment. Created by Simbe Robotics, Tally is looking to take on the world of retail. Able to check stocked items with 96% accuracy, Tally can work anywhere from 8 to 12 hours at a time. Seems like those robot unions need to demand the occasional 15 minute break. But here’s the real question: will Tally be able to give you a stern look if you come into the store 10 minutes before closing time? While we may always question the steadiness of our surgeon’s hands, would you feel better about a machine that lacks years of medical school or a conscience cutting you open? Well, we may know soon enough, as the Smart Tissue Autonomous Robot (STAR) has begun conducting surgery on anesthetized pigs. However, STAR still can’t replace the actors playing surgeons on steamy hospital dramas. Not yet, at least. Shoplifters and skateboarding punks are no match for K5, a 300-pound mall security robot with the ability to remember license plate numbers. The machine, developed by Knightscope, uses everything from a 360-degree view to thermal imaging while making its rounds. So it’s kind of like Hal 9000 meets the Predator. Doesn’t that make you feel good about letting it monitor your teenager? Now’s the time to belly up to the bar and drink away your anxiety about the robot-dominated future with B-10 and N1-C. The two robots, whose names together cleverly spell Bionic to distract from the fact that two human bartenders are now unemployed, have become very popular as the bar staff of Royal Caribbean Cruise. But can the B-10 or N-1C listen to your relationship problems as they pour you a drink? That’s one small step for…robot. Not quite as catchy. Many of us grew up with the dream of one day experiencing space flight and exploring the unknown realms beyond our own world. However, why would a human want to experience the unbelievable phenomenon of zero gravity or gaze at the Earth in all its beauty when you can send a robot to do it? 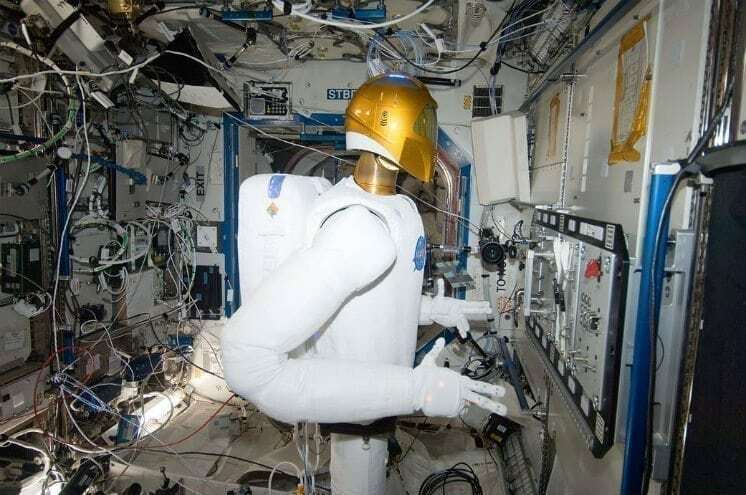 Robonaut 2, which has been in development since 1996, may someday replace human astronauts. So, in just a few years, look for people to deny that robots landed on the moon. And now we take a look at Articoolo, which is more of a software than a robot. All the more reason not to use it. What Articoolo specializes in (if you can fathom something so ridiculous) is writing articles. But who would want a nonhuman to do that? Sure, it can write over 1,000 articles a day without requiring payment, but will it ever apply the love and care of the 12 hours it took me to write this piece? You can never replace the biting wit and journalistic talents of a human, right? …Right?